The Third Michigan Company, a group of Civil War re-enactors based in Grand Rapids, load their guns during a demonstration Sunday afternoon. Dozens of re-enactors camped at the Zeeland Historical Society’s Step Into the Past event Friday, Oct. 3 through Sunday, Oct. 5. at Huizenga Park. The Third Michigan Company, a group of Civil War re-enactors based in Grand Rapids, fire their guns during a demonstration Sunday afternoon. Visiting Zeeland's Huizenga Park last weekend was like taking a stroll through history. The Zeeland Historical Society's Step Into the Past event ran from Friday to Sunday afternoon. Historical re-enactors camped out, portraying soldiers, traders, American Indians and settlers from the French and Indian War to the present. Visiting Zeeland’s Huizenga Park last weekend was like taking a stroll through history. 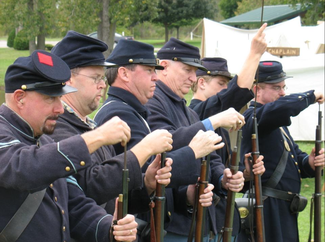 The Zeeland Historical Society’s Step Into the Past event ran from Friday to Sunday afternoon. Historical re-enactors camped out, portraying soldiers, traders, American Indians and settlers from the French and Indian War to the present. Holland re-enactor Lew Verburg showed a child what it would have been like to crawl on his belly to carry boxes of ammunition to a World War II machine gun bunker. Most of the re-enactors were locals from Holland, Hamilton and Grand Rapids. “We teach them a little bit of the history of the time,” said Hamilton resident Lloyd Buell, who was dressed like an outlaw French trader. Buell said that French traders were some of the first white people to travel through the Holland era, before the Dutch established a permanent settlement. Janine Horrigan, a re-enactor from Hopkins, worked at making clothes underneath a tent. She said she tried to teach attendees what everyday life would have been like for early settlers. “They get a better idea about how good they have it,” Horrigan said. The Step Into the Past event started with about 275 students visiting on Friday. The event was open to the public on Saturday and Sunday. Former Zeeland Historical Society board member Dawn Lievense, now an Allegan resident, attended the event and was pleased by how much it seemed to have grown. 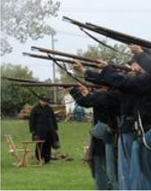 Zeeland resident Terri Kellogg enjoyed watching a group of Civil War re-enactors load and fire their guns. She attends “Civil War Round table” events at the Howard Miller Library, where history buffs listen to a different speaker each month. “I’ve become kind of a little bit like a Civil War History Buff,” she said.